Ebanel Advanced Retinol Moisturizer is a really great, inexpensive retinol moisturizer which works better than many other more expensive retinols. The texture and feeling of this retinol moisturizer is thick and silky which leaves your skin feeling silky smooth. It’s very easy to apply with a pump applicator, and even though the moisturizer is thick, it spreads out evenly and you don’t need too much product to cover your whole face and neck. After using Ebanel Advanced Retinol Moisturizer for a short amount of time, I noticed my skin was much more hydrated and soft. After using Ebanel Advanced Retinol Moisturizer for a longer period of time, my skin felt and looked much smoother in texture. My skin felt super soft and hydrated. I noticed my skin was nice and plump and my fine lines and wrinkles looked smoother and less visible than normal. Overall, Ebanel Advanced Retinol Moisturizer works great to help plump up your fines lines and wrinkles and smooth out the texture of your skin leaving it feeling super soft and even. The texture of Ebanel Advanced Retinol Moisturizer is thick and silky but it feels non-greasy, and although it’s thick, it really doesn’t feel like it’s clogging the pores. My skin felt soft after applying this product and like it could still breathe. Ebanel Advanced Retinol Moisturizer is super easy to apply; it comes in a bottle with a pump applicator which makes it easy to control the amount of product you pump out and apply. Even though Ebanel Advanced Retinol Moisturizer is thick, it applies nicely onto the skin and it spreads out pretty thin and even. You really only need about 1-2 pumps to cover your whole face, neck, and chest. Ebanel Advanced Retinol Moisturizer dries kind of slowly; it takes about a full minute to dry, and even after it’s dry, it leaves a bit of a residue on the skin. The residue isn’t greasy or gross though, it feels silky smooth and really soft. The smell of Ebanel Advanced Retinol Moisturizer is really soft but it kind of smells like a typical baby lotion. I enjoy the smell of it. After using Ebanel Advanced Retinol Moisturizer, my skin felt really soft and hydrated, but I didn’t notice too much of a difference to my fine lines or wrinkles. After using Ebanel Advanced Retinol Moisturizer for a longer period of time, my skin was very hydrated and the texture was super soft and smooth. I also noticed my fine lines and wrinkles were much more plumped up and smoother than normal. I was especially impressed with how soft and smooth my skin was. Ebanel Advanced Retinol Moisturizer is full of a bunch of great ingredients that can help reverse the signs of fine lines and wrinkles a lot such as shea butter, jojoba oil, and resveratrol. Shea butter is great for softening and smoothing the skin as well as smoothing out fine lines and wrinkles and keeping the skin super hydrated which can help plump up the skin further. Jojoba oil is rich in vitamin E which can be good for fine lines and wrinkles because it helps to not only help fight off free radicals from the skin, but also has antioxidants which are great for the skin and anti-aging. Resveratrol is great for anti-aging because it’s full of antioxidants which are supposed to help smooth the skin and help smooth out fine lines and wrinkles. These three ingredients when working together can greatly help the skin with fine lines and wrinkles. 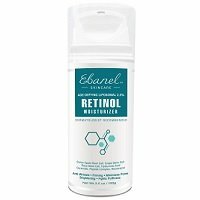 The cost of Ebanel Advanced Retinol Moisturizer is $15.99 for 3.5 oz of product which comes to $4.56 per oz. This is a very inexpensive price for a retinol moisturizer. There is a 30 day money back guarantee for Ebanel Advanced Retinol Moisturizer. To buy Ebanel Advanced Retinol Moisturizer, click here. Ingredients Resveratrol is filled with antioxidants.